Review exercises for the beginning of the school year. They listen to the song and choose the correct colour.They look at the video and write the colours. Choose the correct number. Choose the correct colour. Try to mix the colours! Vocabulary for Cambridge YLE Starters tests. Colours. 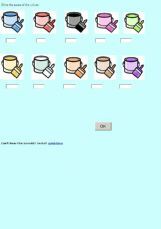 Let�s practice writing the names of 10 different colours in English and let�s practice easy to read nouns. 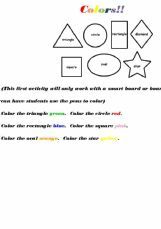 This is an activity where students can practice their colors when they are first learning them! Great for ELL or early learners. 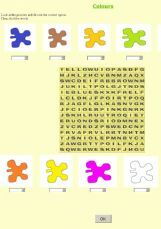 Created for use with very small children who don�t yet read or write confidently in their own language. Watch a video and practice colours. Colours: Look, choose and find.